This is a crappy cell phone photo, but I captured the rare moment while still in bed yesterday morning. If I'd gotten up to get the real camera, they would have moved in anticipation of something to eat. Cosette and Little Guy have merely tolerated each other for the eight-plus years they have lived together. Cosette had been an only dog for about seven-and-a-half years and it was a big adjustment. Little Guy came into our home thinking he'd suddenly take over as alpha dog. This did not go over well with the true leader and he was soon put in his place. When Rusty became part of the family a year or so later he bonded immediately with both dogs. 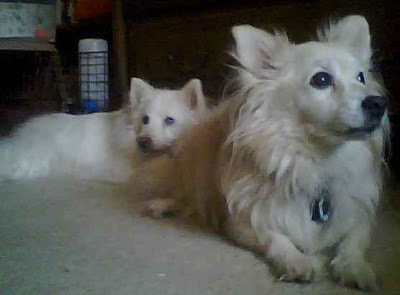 He and Little Guy became playmates and Rusty took on the role of the puppy Cosette never bore. Little Guy and Cosette haven't fought since the very beginning, but they simple coexist. I think that's why I was a little surprised to see them lying so close together, which is something they just don't do. Cosette kept getting bopped in the face when Guy would wag his tail, but she'd simply move her head position and that was it. At first I thought it was a really sweet moment and perhaps it was. In reality though, I think it was more likely that nearly seventeen-year old Cosette and almost thirteen-year old Little Guy, who is still recovering very slowly from his knee surgery, have difficulty moving and can't be bothered to get up for such a trivial matter. I can imagine you being totally stealth and ninja-like while reaching for your camera phone! I'm the same way with Em during special moments. great pic! Cosette still looks beautiful!And of course Little Guy is precious!